Packed with lots of personality, just like the little lady in your life, the Charlotte Door Chest offers a large mirrored door and 4 storage drawers. Plus, it has a secret felt-lined hidden drawer for keeping treasures. The inside offer a handy corkboard, 1 cubby, and 2 adjustable shelves. Plus, a slide out garment hook on the case side is perfect for a robe or other accessories. 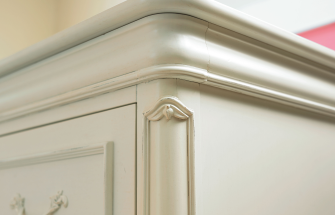 Traditional style constructed with poplar solids and birch veneers in an antique white finish with light distressing. 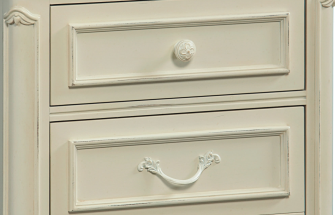 Features antique white painted knobs and pulls with light distressing.